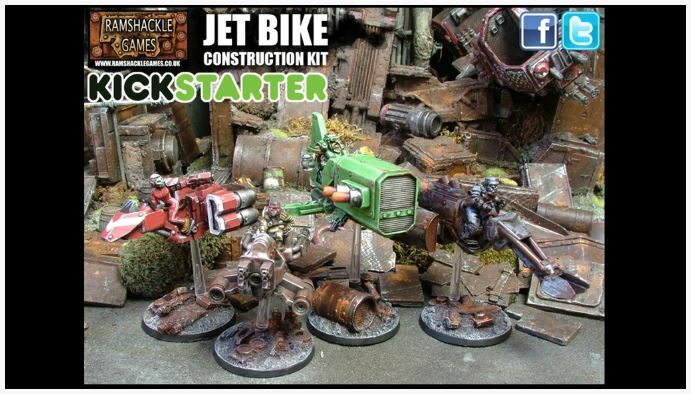 Ramshackle Games arerunning a project for a Jet Bike construction kit. They are producing several different 28mm resin Jet Bikes, plus extra bits, which can be constructed as intended, or customized to create your own unique vehicles. The project had a funding goal of just £50, and has (at time of writing) raised over £2700. The project is running until the 7th January, with delivery due in June 2017. Christian Agostini is looking to produce a new range of 28mm American Civil War miniatures in metal. The project has raised just under 15% of its 10,000 EUR funding goal, and is running until January 2nd 2017. Delivery is due in June 2017. Topexx Dominions is a forthcoming miniatures game, and this project is to produce the first character figures for the game. These are metal miniatures, advertised to 35mm – I can’t decide whether this is a new scale or just heroic 32mm sized figures. The figures look nice though. The project is just over 200% funded at time of writing ($400 funding goal) and is running until Wednesday 4th January. Delivery is due in April 2017. An interesting take on making portable gaming boards. These are made from 4mm MDF. What is actually being sold are just the plan fold-up boards, but it’s an interesting idea. The project has reached 50% of its £4,000 funding target, and is running until 3rd January 2017, with delivery due in March 2017. Maurizio De Guidi from Italy is looking to produce 10 different design of vinyl gaming mat to play ‘Fantasy Football’ – OK, we all know what these are, don’t we? Each mat will cost 30 EUR plus shipping. The project has hit 20% of its 3,000 EUR funding goal, and is running until the 9th January 2017, with delivery due in March 2017. Abaddon `is a sci-fi themed game using Richard Borg’s ‘Commands & Colors’ rules with infantry and Mechs, and Shattered Command is an expansion for this game. This project is to produce the expansion, but you can also order the original game. The project has reached just over a quarter of it’s $12,000 funding target, and is running until 18th December, with delivery due in May 2017. Whilst the pledge price for the game and expansion is very tempting, the shipping cost (and subsequent import charges) for non-US customers will, I believe, preclude them from pledging for this game, which is a shame. Spanish company Zenit Miniatures is looking to produce a miniature boardgame inspired by fantasy Japan, with chibi-looking miniatures. The project has gained close to 3 times its 50,000 EUR funding goal, and is running until the 19th December. Delivery is due in December 2017.